Canadians play a significant role in the history of the spread of Ayn Rand’s philosophy, Objectivism. 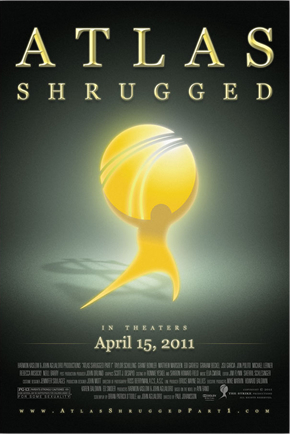 Yet, as of March 22, 2011, the list of theatres in which “Atlas Shrugged, Part 1” will be screened includes none in Canada. That has to change and, given that “Atlas Shrugged, Part 1” hits the silver screen on April 15, 2011, it has to change now. Ayn Rand began as a fiction writer. She published her master work, “Atlas Shrugged“, in 1957. Thereafter, it was the Canadians – including Leonard Peikoff, Nathaniel Branden, and Barbara Branden – who successfully encouraged her to commit her philosophy to writing in non-fiction form. Initially with Branden (who was born in Brampton, Ontario, just to the west of Toronto), and then without him, Rand published three sets of newsletters (her non-fiction books a comprised primarily of the articles appearing in those newsletters). Afterward, Peikoff (who was born in Winnipeg, Manitoba) published a masterful, clear, concise, and extremely well-organized text, “Objectivism: The Philosophy of Ayn Rand” (often referred to as “OPAR”). With financial input from Ed Snider, Peikoff essentially launched the Ayn Rand Institute, which has continued to grow in influence, especially within the USA. And, but for Ayn Rand, there probably would never have been a Freedom Party of Ontario: Rand’s “Capitalism: the Unknown Ideal” (a collection of articles drawn from the aforementioned newsletters) sparked an understanding of and desire for freedom in the founders of the party. As leader of that party today, Rand’s philosophy serves as my philosophical foundation. With a provincial election looming (October 6, 2011), my shoulders are rather loaded down. However, faced with the fact that Atlas Shrugged so far will not be screened in Canada, I have today begun the process of attempting to contact whoever has the authority to permit me to screen the movie in the Toronto area. Theatres can be rented, and private screenings can be arranged, but before that can be done, we need to know that those with authority to allow us to screen Atlas Shrugged will allow us to do it. If I am able to arrange a screening in the GTA, I will post here information about where and when the movie will be screened, ticket costs, etc. I wish you luck. I think the major success of this movie will be sales of DVDs. Like the book, it should be selling for generations. I don’t think it’s going to happen. I read that the filmmakers are hoping the film will be considered for the Cannes FF, and rules state it cannot be shown outside the country of origin. I guess we’ll have to wait or cross the border! The Cannes list came out on April 14th and Atlas Shrugged is not on the list. I was speaking to the manager at Kennedy Commons AMC in Scarborough (Toronto) and he said that he is trying to get the movie and told me about the Cannes thing, which I already knew. When he heard that he said that first thing Monday he will be on the phone trying to get it. I really hope they get it. I really want to see it. When I contacted cineplex they said that they have no plans to bring it. Good to know. Perhaps other AMC theaters would be open to getting it as well. Time to get on the phone! I’m in Burlington but would drive to Scarborough to see the film. I’m in Toronto and would love to see the movie. I really really hope this goes through. I’ve placed a rough list of some theatre chains at http://www.keithsketchley.com/theatres.htm. You can email additions to me. I did use Cineplex’ contact form and got into a debate with a bureaucrat who focused on needing a distributor to offer in Canada. Montreal, Toronto, Ottawa… I will watch it in any of these cities, and have friends that want to as well. It’ll be a huge shame if they never release the film in theaters up here. I’m sure I’ll be able to find a way to see it online if needed, but I’d much prefer to support the producers of the film by paying to see it at a cinema. Any news? Is it coming to GTA or do I have to drive to Buffalo to see it ? All the brainwashing movies they will show here !!! But of course not this one, cause we will know what is happening !!! F.ing B.S. FYI, the movie is being released at AMC Theatres Yonge & Dundas this Friday October 28th. This has been officially announced by Atlas Shrugged movie site & blog. Showtimes are on AMC website, although the times have not officially been confirmed.